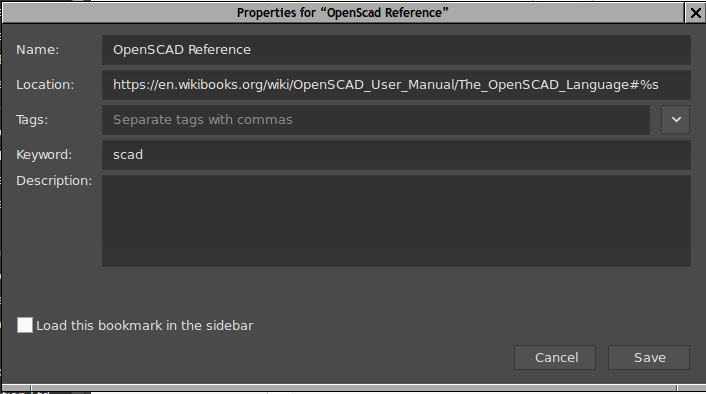 As a handy way to do a quick help lookup for openscad built-ins, you can make use of your browser keyword bookmarks. 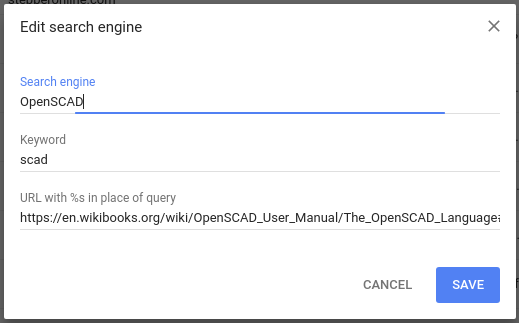 This means you can type "scad multmatrix" into the browser URL bar and it'll jump to the relevant section of the language reference on wikibooks. This is assuming you use firefox, but the equivalent is possible in Chrome and probably other browsers. Then open the bookmark properties and in the Keyword field, enter "scad" (or whatever else you want your help keyword to be). Save the bookmark and give it a go. It'll work for anything in the language reference that has a direct link target available. We can probably tweak the wikibook so that the few that don't currently work (e.g. text, linear_extrude, use, include) do have an appropriate target. Turns out you can do it in chrome (it's even a little nicer in how it operates than firefox). working like a charm, Len. Thx for sharing.